If you want book #1 it’s HERE and currently 40% off! Sew Along Starts June 14, 2018, in a few weeks! Meet 80 designers and be prepared for learning, fun, and friendship! I’ll go through some thoughts about fabric so you can gather your collection to be ready to start sewing with us on June 14! Firstly, let’s talk color selection. Many people told us that having a selection to work from was the most effective way to approach a 100 block sampler. We like selecting a fabric line and then adding a few more FQs to it so you have some consistency across the blocks. You can also add from your collection to give it more variety as you go along. Other people liked to make it very scrappy pulling from their own fabric and using a consistent background. As designers, both Jane & myself and our entire design team of 80, feel that having a consistency when creating a quilt of 100 unique blocks, will make us happy. Having a color scheme, a certain fabric, or set of fabrics, used often, tie it all together. A sampler is not like a repeat block, each is unique and your fabric choices help you create an amazing quilt. Like most samplers, there is not a ‘one to one’ fabric placement guide. We suggest building a working set of fabric. Included in there is a background that can be used in the block. Our Balance, the Elephant, had a background behind the toy elephant. In Rebecca’s Milk & cookies it could be one of the fabrics for the HST. Each block you look at for your fabric and decide, which is part of the amazing fun & learning experience of doing the Splendid Sampler with us, there are so many things to learn. Eventually you will decide on a setting. You might use the one from Book 1, or when Book 2 comes out you might use that. At some point when you know your setting you do some analysis of where your blocks are heading and what fabric you want to use. About 40 Fat Quarters. Many Fat Quarter bundles are close to that. When purchasing a bundle look at how many fabrics are in it as some bundles are only 20 fabrics. 3 yards of a background fabric, more if you feel you might want to use in a lot of the blocks. Also, many of our designers have fabric lines, so you may want to pick up pieces of their fabric for their blocks! 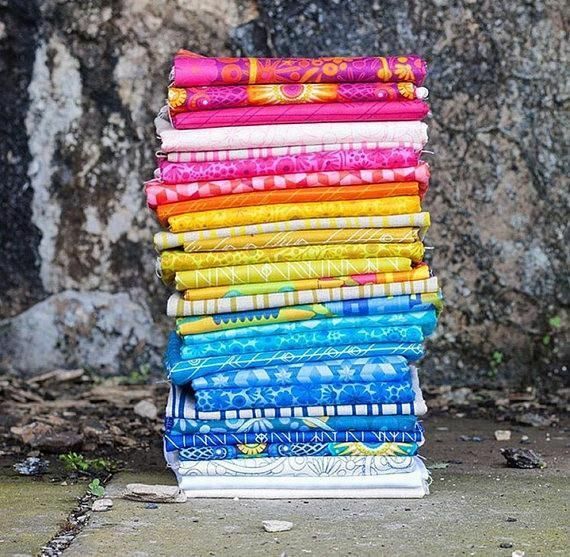 Personally, I am starting with a bundle, some additional Fat Quarters in the smaller scale prints, and a background I’ll use throughout the quilt. I’m still making my FINAL decision but those prints from Figtree might be the one! This is an example of two lines from the same designer that work beautifully together if you want to mix and match. 6″ finished blocks are smaller blocks. If you love large scale prints try cutting a piece of it to a 1.5″ square to see how it looks. The Splendid blocks have many more small pieces that work nicely for smaller scale prints. But not all the blocks have tiny pieces, so having a mix of scale is nice to give a slash to the larger spaces. My larger scale Sunday Drive Fabric on the right, which is on sale right now! Check out the Fat Quarter Bundle Sale area, some really darling things! Be sure to get enough if you buy things on sale! Unless you use a basic, many fabrics are printed once and that is it. So if you love the fabric get a bit more just in case. You might need to remake blocks, you might find you have more waste with small scale. Better to be safe for a year long project. The nice part about designer lines is that often one line works with the next. So if you need a bit more you can get it from their next line. Here are a few examples of quilts made by the members of our group from our first book. Fabric selections make such a huge difference, and we wanted you to see how different they can look. And Join our Facebook Group for all the fun!